abnormal shortening of muscle tissue, rendering the muscle highly resistant to stretching; this can lead to permanent disability. It can be caused by fibrosis of the tissues supporting the muscle or the joint, or by disorders of the muscle fibers themselves. 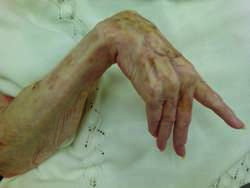 Improper support and positioning of joints affected by arthritis or injury, and inadequate exercising of joints in patients with paralysis can result in contractures. For example, a patient with arthritis or severe burns may assume the most comfortable position and will resist changing position because motion is painful. If the joints are allowed to remain in this position, the muscle fibers that normally provide motion will stretch or shorten to accommodate the position and eventually will lose their ability to contract and relax. In many cases contractures can be prevented by range of motion exercises (active or passive), and by adequate support of the joints to eliminate constant shortening or stretching of the muscles and surrounding tissues. Dupuytren's contracture a flexion deformity of the fingers or toes, due to shortening, thickening, and fibrosis of the palmar or plantar fascia. ischemic contracture muscular contracture and degeneration due to interference with the circulation due to pressure or to injury or cold. Volkmann's contracture contraction of the fingers and sometimes of the wrist, or of analogous parts of the foot, with loss of power, after severe injury or improper use of a tourniquet or cast in the region of the elbow. a progressive painless thickening and tightening of subcutaneous tissue of the palm, causing the fourth and fifth fingers to bend into the palm and resist extension. Tendons and nerves are not involved. Although the condition begins in one hand, both become symmetrically affected. Of unknown cause, it is most frequent in middle-aged males. Early surgical removal of the excess fibrous tissue under general anesthesia restores full use of the hand. An incision is made in the palm, and the thickened tissue is excised carefully to prevent injury to adjacent ligaments. Contraction of a muscle in which the muscle tissue has been replaced by fibrous tissue because of injury. Contraction of a muscle that decreases during anesthesia or sleep. Adaptive shortening of muscle, usually caused by immobilization and without tissue pathology. A temporary condition in which tension and shortening of a muscle are maintained for a considerable time although there is no tetanus. It may be induced by injury, disease, heat, drug action, or acids. An apparent permanent contraction of a muscle due to a central nervous system lesion, resulting in loss of range of motion and resistance of the muscle to stretch. Shortening of some of the tendons on the palm of the hand, as a result of inflammation, so that one or more fingers are pulled into a permanently bent position. The ring finger is usually the first to be affected. Treatment is by careful surgical removal of the thickened, contracted tissue. The condition is unrelated to manual labour. It is believed to be mediated by free radicals and is commoner in people with AIDS than in the general population. (Baron Guillaume Dupuytren, 1777–1835, French surgeon).